We all know what happens when a train comes toward us at full speed with its horn blowing. 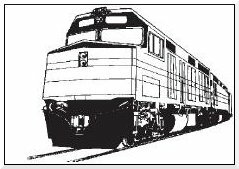 At first the sound is very high pitched, but it drops quickly as the train passes by and becomes quite low-pitched while the train speeds away. The Doppler effect is a useful analogy for what happens on a windward-leeward course. When you sail upwind, it's like being on front of the train. Since you are sailing toward the wind, you will get the shifts and puffs at a faster rate than if you were sitting in an anchored boat. Conversely, on a run you are sailing away from the wind, so you get the shifts and puffs at a slower rate. That's like what happens after the train passes the point where you are standing. Though you won't hear any changes in pitch when you go from beating to running, you may notice some subtle changes in the wind. To illustrate this, let's consider an example. Suppose you are sailing around on the starting line and you will find that the wind is oscillating every five minutes. As you sail up the first beat, will the shifts come at you at the same rate? The answer is no. Since you are sailing towards the shifts, you will get them faster, perhaps every three or four minutes. How about when you round the windward mark and sail down the run? Since you are sailing away from the shifts, you will get them less often, perhaps every 7 or 8 minutes! The strategic implications of this phenomenon are significant. For example, if there are 8 minutes between shifts when you are sailing downwind, it is possible you will only see one shift on the run. And if you get only one shift on the run, it means you should treat that as a persistent shift (even though the overall wind pattern is oscillating). 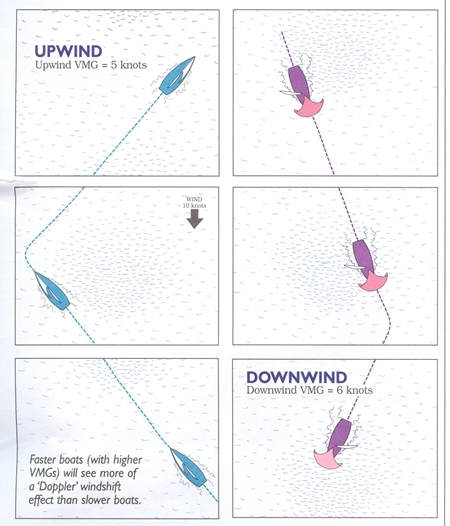 The 'Doppler' windshift effect also explains why better pressure is so critical downwind. Since you are sailing with the wind, you won't see so many puffs, but you can stay in one much longer than on the beats. Therefore, getting into the puff and using it fully is critical for optimum performance. On a beat, the speed at which you converge with shifts (and puffs) is roughly equal to the sum of the wind speed plus your VMG to windward. In this case, that’s 10 (windspeed) plus 5 (VMG), or 15 knots. But on a run, the convergence speed is the wind speed minus your VMG to leeward. Here it’s 4 knots (10 minus 6). So on a run the shifts are coming at you several times more slowly than on a beat, so you will experience that many fewer shifts.